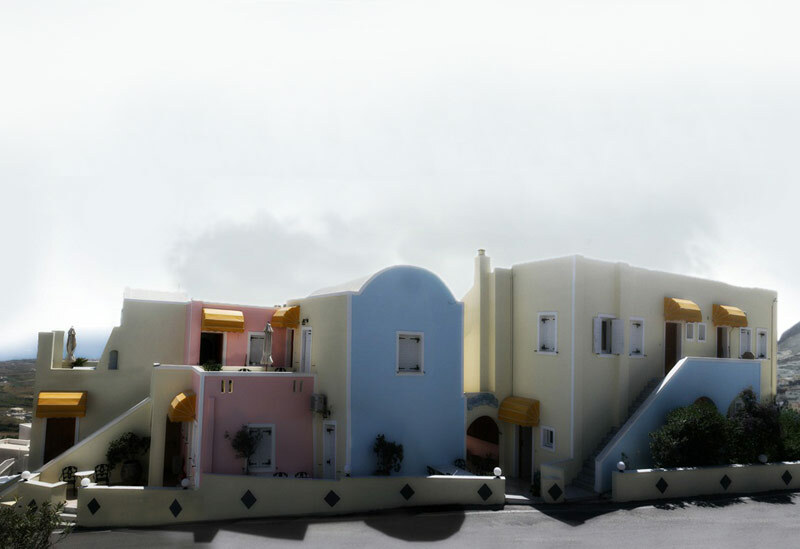 Sky of Thira is a new built complex of Apartments in Firostefani - Santorini. It is of A class type with 10 spacious rooms built in accordance to the traditional Cycladic architectural style, while at the same time all modern facilities ensure you a comfortable stay. Sky of Thira hotel is designed at the best way in order to make your vacation relaxed and pleasant. You can start your day off by taking a good breakfast and then swim at our swimming pool. If you get thirsty enjoy a cool refreshment at the pool bar or at the bar inside our hotel. Don't miss the barbecues organized at the beautifully decorated garden. It is the ideal place for families as it has a safe children playground. All rooms have a balcony and they all have air conditioning, heating and direct-dial telephone. They are equipped with satellite-TV, refrigerator, mini bar. The apartments consist of two bedrooms and a separate kitchen. All the rooms have a balcony and they all are air conditioned, having heating and direct-dial telephone. They are also equipped with satellite-TV, refrigerator, mini bar, electrical hot plates, toaster as well as tea and coffee making facilities. Sky Of Thira also provides laundry services, drying, awakening, every day cleaning, change of sheets and towels, gym, non-smoking rooms, transportation from/to the Hotel, parking. Sky Of Thira Hotel is situated at the highest point of the most graphic and peaceful neighborhood of Fira town, Firostefani. It is the ideal place to stay as it is only 5 minutes from the town centre and the bus station. A mini market is only 2 minutes from our hotel as and a restaurant. The airport is 15 minutes by taxi or by bus and the nearest beach is 5 minutes from it.